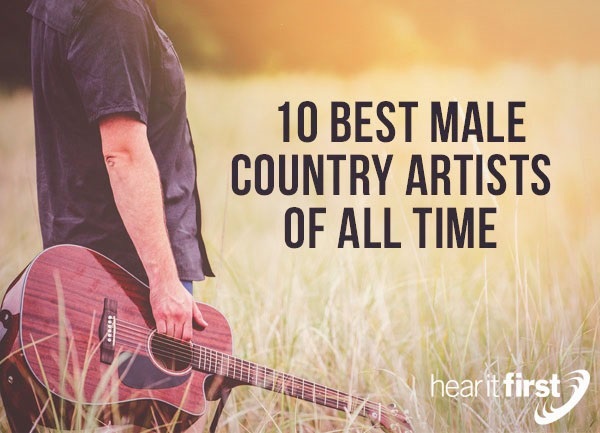 Here are what most believe to be the ten best male country music singers of all time. There isn’t much debate about the best male country music singer of all time in country music being Hank Williams. He is by far and away everyone’s choice as the greatest country music singer of all time. Hank Williams was born in a log cabin in Alabama in 1923. He was the pioneer mover and shaker for country music in the beginning and particularly, the Honky Tonk type of country music. He insisted on writing all of his own material and these same songs have been sung by hundreds of other country music artists since then. He is a legend today in country music, but his greatest mark may have been his song writing ability. That may have been his greatest gift of all. Most country music historians believe it was Johnny Cash who was responsible for some of the roots of rock and roll, but also what they call, “rockabilly,” as it may have originated with Johnny Cash. In fact, country-rock may have been heavily influenced by Johnny Cash. Johnny Cash has been one of the most influential country music singers of the 20th century. He is certainly one of the all-time best selling artists. This man’s ability to cross over into different genres, like the blues, gospel, rock, and country placed him in the Country Music Hall of Fame, the Gospel Music Hall of Fame, and even the Rock and Roll Hall of Fame. No one else had ever done that. His classics, “Ring of Fire,” “Folsom Prison Blues,” and “I Walk the Line,” are country classics, but his song, “A Boy Names Sue” crossed over into the rock charts top 10. George Jones was “the voice” of country music for decades on the radio. Most people didn’t have to wait very long to hear a Loretta Lynn, Tammy Wynette, or old Hank Williams song, but rare was the day in the 1960’s and 70’s when you didn’t hear a song by George Jones. For a time, George Jones and Tammy Wynette sang as a duet, but George Jones had already been a star by then and today is among the top ten male country music singers of all time. Blake Shelton has made a great impact on country music in a very short time and he’s not yet finished. He’s not only a country music singer, but he’s also a songwriter and celebrity. His song, “Honey Bee” was his ninth number one song on the country music charts, but he began to move into different directions with his song, “Sure Be Cool if You Did” (2013) which took a modern production and fused it with some classic instrumentation and this helped it soar to number one on the country music charts. Other classics include “Hill Billy Bone” (with Trace Adkins), “Who Are You When I’m Not Looking,” “Goodbye Time,” and several others which reached number one on the charts. George Strait has so many country classics that at one time he had three different songs in the top forty at the same time! From people that know him, George Strait is one class act of a man, but more than that, he is a hall of fame country music singer. It doesn’t seem that success has messed with George Strait’s head at all. He’s still just as down to earth as anyone you’d meet. George Strait is an American singer, songwriter, actor, and music producer who is known as the “King of Country.” He’s also one of the most influential and popular recording artists of all time in the country music realm, and he is as “country” as they get! He wears the tradition cowboy hat and in his songs, the cowboy can clearly be heard. Classics include “Gone as a Girl Can Get,” “All My Ex’s Live in Texas,” and perhaps his best known, “Amarillo by Mourning” which thrust him into the spotlight, and there he has remained as one of the ten best male country music singers of all time. Clint Black is also a very traditionally country music artist in the same vein of George Straight. He’s also a very accomplished country music singer, songwriter, musician, multi-instrumentalist, record producer and actor, and at one time, he produced five straight number one songs on the country music charts. Songs included “Like the Rain,” “A Better Man,” “Killin’ Time,” and the fast-paced “Summer’s Comin,’” and talk about an impact. Clint Black has consistently charted hit songs into the 2000s and now has more than 30 singles on the US Billboard country charts, twenty-two of which have reached number one on the country music top 100. Charlie Pride is a gentlemen’s gentleman. In other words, he’s has an exceedingly polite man who has a silky, golden voice to match it. His voice is like no other on the radio, even today. This country music hall of fame singer is also a musician/guitarist, performer, and business owner. When his songs were released, they’d often shoot their way up to number one in a matter of days. And Charlie Pride was able to hold onto the number one position, sometimes for several weeks, with songs like “Kiss An Angel Good Morning.” In the 1970’s, next to Elvis Presley, he was RCA’s bestselling artist, and so he is certainly one of the ten best male country music singers of all time. Brad Paisley burst onto the country music scene like a flood. Brad Paisley is an American country music singer and songwriter and is considered one of the best there is today. He started his career with his debut album, “Who Needs Pictures” (1991). Up to now, Brad Paisley has had 32 top ten singles on Billboard’s country music chart with 19 of those soaring to number one! In 2009, he set a record for the most consecutive number one songs on the country music charts. Some of his greatest songs include “Whiskey Lullaby,” “She’s Everything,” Mud on the Tires,” and recently, “Without a Fight,” a duet with Demi Lavato. Brad has quickly found a place among the greatest country music male singers in history and has not finished making his mark. Kenny Rogers, singer, songwriter, actor, and businessman, was listed as the most popular country music male singer in 2015. He already resides in the Country Music Hall of Fame with over 120 singles on the Billboard charts and if you count pop and country, and incredibly, he’s topped the pop and country charts over 200 times with songs like “The Gambler,” “Coward of the County,” “Lady,” “She Believes in Me,” and “You Decorated My Life.” Kenny Rogers has sold over 100 million albums and has earned about every award you can think of, like a Grammy, an AMA Awards, a CMA Awards, and an ACM Award, along with several other prestigious accolades and awards. Kenny Rogers squarely belongs among the top ten best male country music singers of all time. Randy Travis is an American singer-songwriter, guitarist, and actor and has charted over 50 country music songs on Billboards country music charts top 100. It would take more than one album to include all of Randy Travis hits which included “Three Wooden Crosses,” “Deeper Than the Holler,” Diggin’ Up Bones,” “Forever and Ever, Amen,” and several Christian songs. Randy Travis has charted over 50 singles on the Billboard’s Hot Country Songs Chart and had 16 songs charted at number one from his 20 studio albums, and he’s sold over 22 million records worldwide and has carved his place into the top ten male country music singers of all time. There are other male country music singers that I know could be placed among or near the top ten of all time. These include Alan Jackson, Garth Brooks, Merle Haggard, Waylon Jennings, Willie Nelson, Alan Jackson, Tim McGraw, Don Williams, Marty Robbins, and Ray Price. These are all country music hall of fame singers, so it’s difficult to restrict the all-time male country music artists to only ten. If you feel we’ve left someone off this list, please feel free to add their name.